It is extremely important to check the genealogy of every cat when a stud or queen is bought. 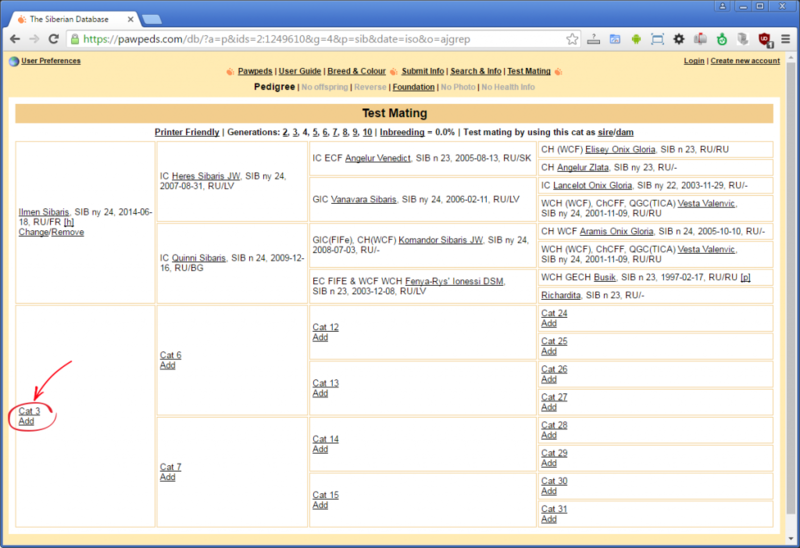 For this purpose, there is Pawpeds and soon we will have an exclusive Sib only database with similar tools available. It will be even easier to check cats since I intend to separate groups by colour. There is always challenges in breeding and we, Siberian breeders, accept an extra challenge which is the search of cats with a good pure Siberian genealogy. Like seen our “phylosophy page”, the profile we search is a cat that belongs to group 1 to 3 or a new foundation cat with the condition that the element correspond to Siberian phenotype with interesting profile (where the cat was found, genetics tests made etc). 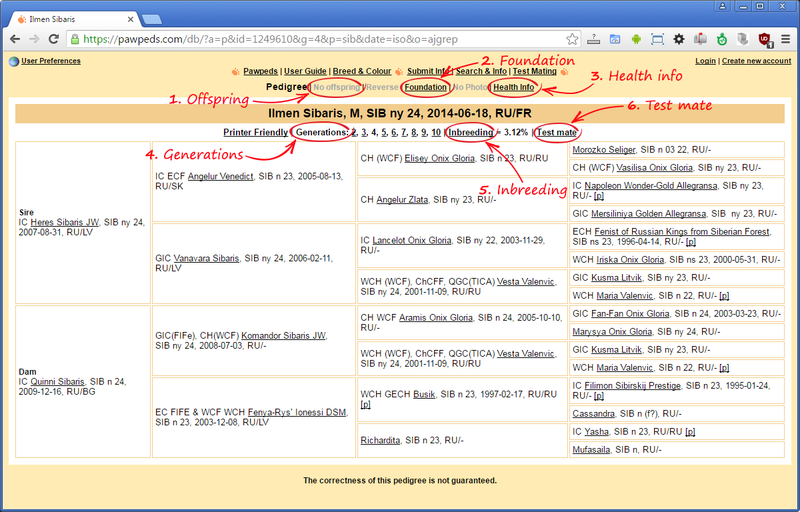 2 – Foundation : If you click on Foundation you will have all the cats that are on very beginning of Ilmens genealogy. 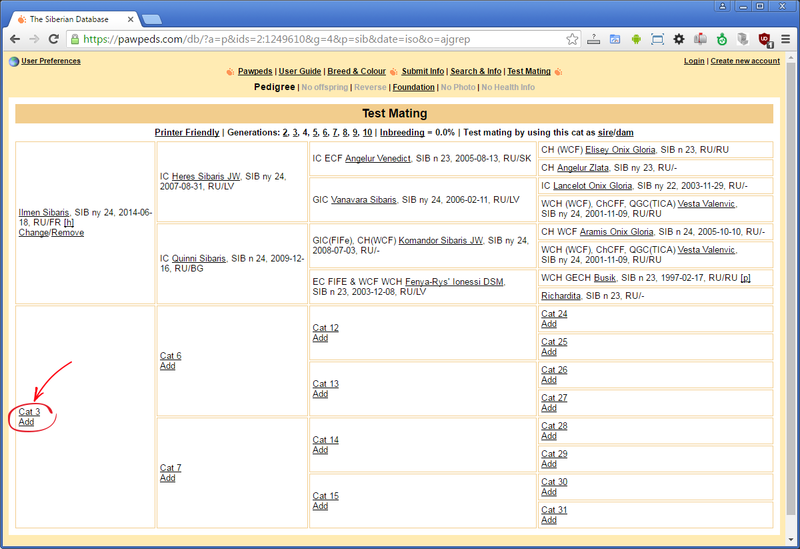 3 – Click number 3 and you will see all the health info gathered about this cat particularly HCM screening. 4 – On generations you can follow each generation of a cat’s genealogy and search for the word “nem”. 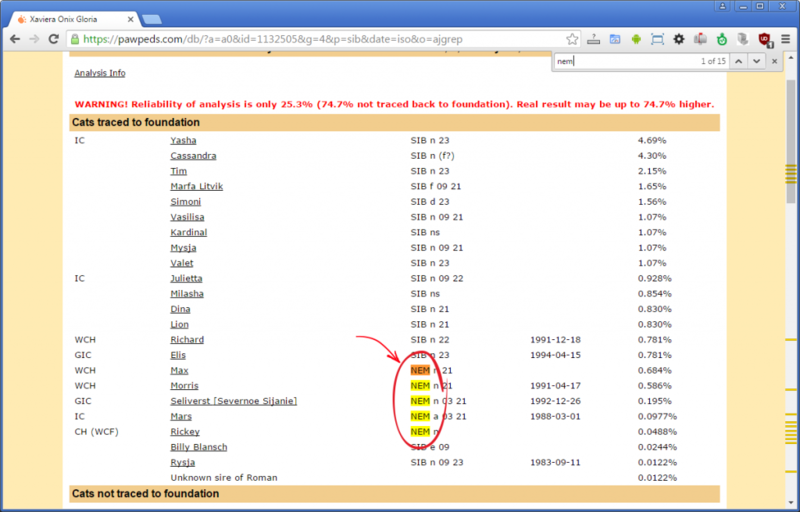 When I search for a nem on a cat’s genealogy I check first “foundation” to see if there is nem at foundation but it also necessary to check the entire genealogy : First I check foundation and then I click on number “10” (generations are displayed by number) and search the document for the word “nem” (Ctrl + F ) and if the genealogy is longer than 10 generations, it is necessary to carry on and check whatever is after 10 generations by clicking on the name of the cat that is closer to the end by checking that cat itself. 5 – Inbreeding: Pawpeds will calculate to you the percentage of inbreeding. 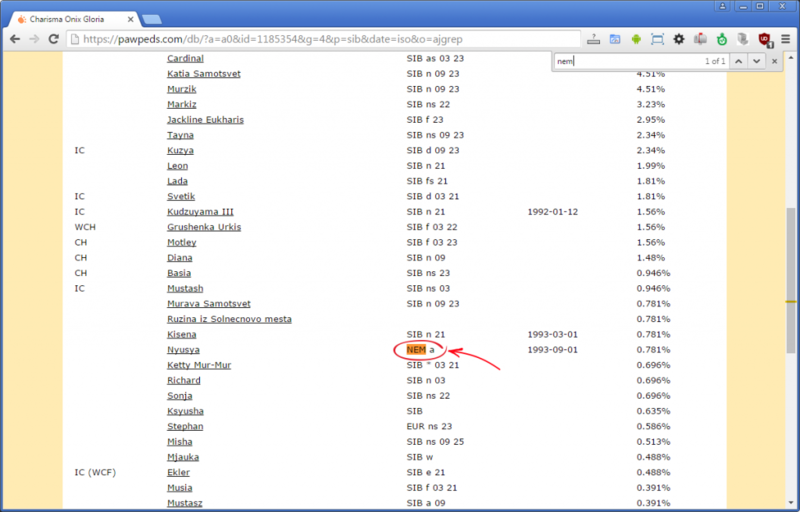 The number that appears after “inbreeding” is the number check with 4 generations: For example Ilmen Sibarishas a total of 3.12% inbreeding on 4 generations (the four cases appearing on that page) if we click on number “10” we will know the percentage of inbreeding in 10 generations for Ilmen Sibaris. 6 – Finally “test mate” is probably the most important tool that will calculate the percentage of inbreeding between a couple. This will help you to make good matches. Top photo: You clicked on a cat’s foundation and found several “nem”. This cat is probably a group 4 (but a check generation by generation should be made). If it is confirmed the cats is group 4, it can be used to make nice pets but it would not be wise to use it in a Siberian breeding program. Mixing cats group 4 with other cats group 3 is like an indirect mixing and often made by people who consider themselves a Traditional Sib breeder. If we mix number 4 with the other groups all the time, soon the other groups will not exist anymore. Second photo: The cat has only the nem Nyusia at foundation (it could have been Mars or another nem) but when there is only nem at foundation, the cat is a group 3 and perfectly good to integrate any Siberian breeding program. Unfortunately these cats are becoming rare to find.Remember group 3 is any cat that have one (or more) nem at foundation but ONLY at foundation. Then you must add the other cat and check the inbreeding percentage and check both genealogies to see if it is a good match. Regarding type cats should be complementary ( a girl with a good profile with a boy that has mediocre profile etc) and if you are starting, avoid close matches. Inbreeding techniques should be left to breeders that know well their bloodlines for long years, 10-020 years and more! A new breeder should not venture working with inbreeding and even not with close line breeding unless with proper guidance from a experimented breeder. A deep knowledge of bloodline is necessary in order to obtain a real benefit from inbreeding and line breeding without opening a door to serious genetic diseases.